When you get a fever and need to check your temperature, I'm sure we'd all feel better if the thermometer stuck up into our bu... I mean in our armpit, was pretty and made by Fabergé. Like this one for example! It was made by workmaster Mikail Perkhin, around 1895. It's very rare to find medical equipment among Fabergé's products, but here we have one! 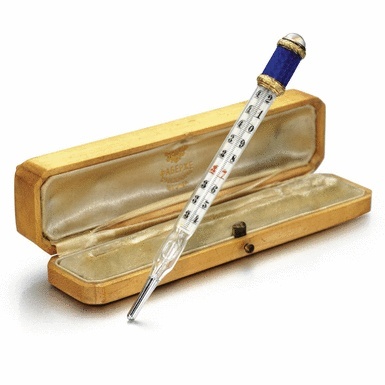 The thermometer has a handle covered in midnight blue enamel over a guilloché ground. It's also decorated with gold bands of chased leaves, the terminal set with a big moonstone. It's 12.9 cm long, denoted in centigrade, and was sold at Sotheby's for 61,250 GBP. That's awesome! I haven't ever seen one like that before!